why we cant have an open beta and if you want expirienced guys to test the beta why dont you let them stream the beta so everyone can tell his thoughts ? Codemasters are doing a closed beta because they want feedback that can help them to improve the game. If it was an open beta, a lot of people would use it as a free-trial. Codemasters filter through who will give them the most feedback to prevent people from using it as a free-trail. I know several people that got in the Beta just because they want to play F1 2018 before everyone and "sweat" it. I still hope that I get the email, I really want the game to improve! Don't forget beta testers can only report things. Not fix em. That's codies job. I beg to differ based on my previous work on f1 2016 and 17. :P I didn't fix stuff directly but I did help provide solutions to a couple of things. How many people are in the beta this year? Whoever the Beta's are I'm sure most want the same thing. You can lead a horse to water but you can't make him drink. They would really test the game, not identify exploits for use after launch. Look, all hope isn't lost at this current moment, last year the beta was released in phases, with more beta codes being given out each phase, so there may still be hope in you, I too am upset that I didn't get a code considering I admin the top teir of a league but for now we must rely that the drivers who got the beta will do well, people may get recommended into the beta also so there are still some chances. lol. I can't remember how much I can say, but it definitely improved the game. Wait league owners? Owners know about the game as much as a normal player, or even less in some situations. Just because they started the league, doesn't mean they are the best to give feedback. 7 patches in 4 weeks if you remember. That's quite a lot of updates considering many of the updates were major. E: I made this message only to tell people that you're painting a wrong picture about some parts. Drivers follow what is defined in a league. So this is why I asked beta test should have included league admins, at least top tiers. League admins "best" know what to test and how to test it. Again for multiplayer!! SC/VSC has been bugged since 2014. Races without SC/VSC are dull and straight forward yet leagues are continuing without it to insure their continuity. This was supposedly an "ESPORTS ready" game. 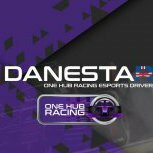 eSports Pro draft will be run on the new game, F1 2018!!!!! Those are valid points, but my point is just that you painted the beta as something which didn't accomplish anything while the beta testers improved the game in many different ways from handling to wet weather balance. We don't know what they are beta testing, other than online content. Beta testing doesn't have to mean testing the functional requirements of a game (e.g. lap times are invalid if more than two wheels are outside the track). For sure, you might be very accurate in your feedback for visual bugs, but for all we know they could be beta testing non-functional requirements (e.g. performance) in a backend code run on servers during online play. And who knows, when it pass the closed beta maybe it will be ready for a more extended (or even open) beta? I'm going to be honest this beta should of been open, why you ask? because the last F1 games hasn't been up to standards and having a open beta would improve the game, COD does it, BF (Battlefield) does it, and im pretty sure some other games do it and lets be honest F1 2017 wasn't the greatest it had issues that could of been fixed if the beta was open. If you disagree thats fine this is my opinion. And no I wasn't comparing a F1 game to FPS games I was saying those games had open betas. The games you name do it just to create hype. Problem with an open beta is you get a lot of feedback on non specific things which makes it a lot harder for Codemasters to really know what the real problems/bugs are. Even if they want do to it like that, they will not have enough capacity to read through everything with an open beta. Lets trust the choices Codies made and just wait and see. 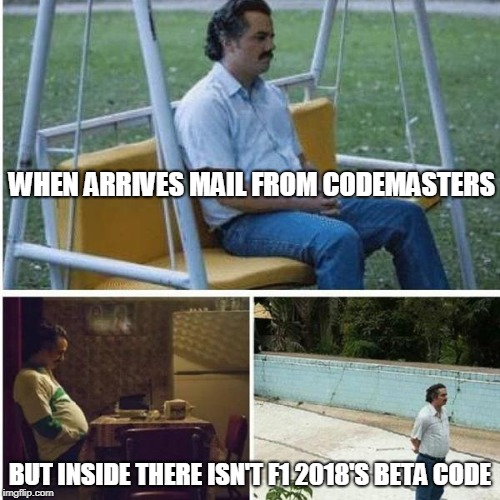 I think all the big youtubers and active forum members here who got a beta code are eager to make this the best F1 game yet, hopefully everyone else picked do have that as motivation as well. I'm sure I heard all this fluff last year?!? ? Open betas from AAA publishers are there to create hype like kipkluif said. Sometimes the game has an open beta less than 24 hours of the release. It's there to just serve as a "free trial" or to hype the community. I can't really remember that many games actually doing it that I enjoy. I agree. We can report bugs and issues and everything and provide solutions as you say. But we can't fix the game. Only provide a helping hand. I say this because a lot of people think that it's the testers fault that the game is 'broken' but we can only help Codemasters not fix glitches. I also want to just say that there are still different ways to report a bug. One may just say that his game froze while another one investigates what causes it by trying to do it again multiple times and then reporting it to Codies with all the information needed to easily fix the bug. E: Apparently even though I didn't press the send comment button twice, it somehow still managed to do a copy of it. uhm its my first time doing the beta test and i where just wondering will the coordinator for all this invite me to the closed beta forums or how dose it work ? And some wonder why those beta tests are "mostly" useless!!!! Bit harsh as they are just asking a genuine question and appears to have the intention of giving feedback which is what it's for - unlike some. Axel - I'm sure Faya will advise if it it doesn't say anything in your email when you get your code. Tarjam, hope you are not one of the beta testers if you can't even answer a civil question with a civil answer, it doesn't inspire much confidence in your ability to communicate properly. Axel, I'm sure you'll hear soon directly from codemasters.